At 7:15, Monday morning, there was a three vehicle collision, west of the Selma/278 intersection. 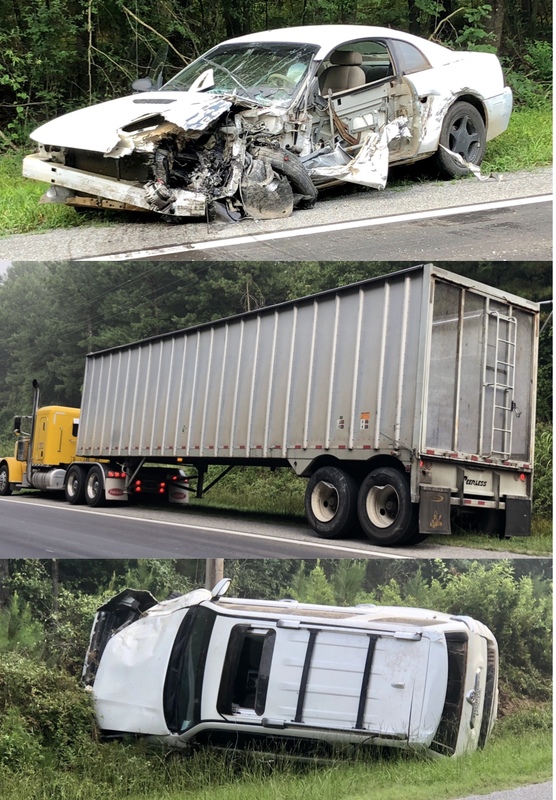 According to sources at the scene, the driver of an eastbound Ford Mustang crossed into the westbound lane, striking the rear wheels of a Peterbilt chip truck, before spinning into the path of a Toyota 4runner. Upon contact, the 4 runner seems to have veered off the highway, likely colliding with a power pole, before rolling over. MASI responded to check the victims, none of whom needed medical transportation. Drew Sheriffs Deputies responded controlling traffic until the roadway was cleared. Rod’s Wrecker and JNA Towing removed the two total vehicles. The 18 wheeler was drivable. This entry was posted on Monday, July 9th, 2018 at 2:37 pm	and is filed under WRECKS. You can follow any responses to this entry through the RSS 2.0 feed. You can leave a response, or trackback from your own site.